PRESS RELEASE: Hot on the heels of Rode's 60p Vicoustic promotion, Universal Audio launch their own fantastic "Total Studio Upgrade" promo for August and September. • Just buy a Universal Audio LA-610mk2 tube channel strip from a participating dealer during August and September 2010, and you will also receive a brand new UAD-2 Duo card (worth £900) in the box…absolutely free. The best-selling LA-610Mk2 combines the classic 610 tube mic preamp with an LA-2A style opto compressor, HF & LF shelving EQ and variable impedance mic & instrument inputs. It's a beautiful sounding and very user-friendly channel strip and makes the perfect front end to any studio. 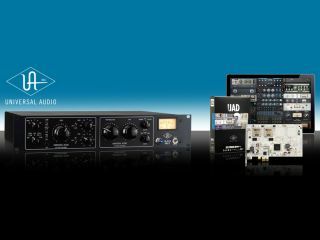 The UAD-2 Duo card provides 5 times the DSP power of the original UAD-1 card and gives engineers access to the finest selection of plug-ins currently available, including the latest UA collaborations with Manley, Trident, Neve, EMT and Empirical Labs. Remember this is only available from participating dealers and that the promotion is limited till the end of September.